When you're ready to order flowers, the process is very simple! Remember the 5 Ws and 1 H (Who, What, When, Where, Why, and How). Who will be receiving the flowers? First and last names are important. We may need to have someone else direct us to the correct person when we arrive, so having their full name is quite helpful. Also, if you have a phone number (and extension, if they have one), it is much easier to deliver your flowers to them. 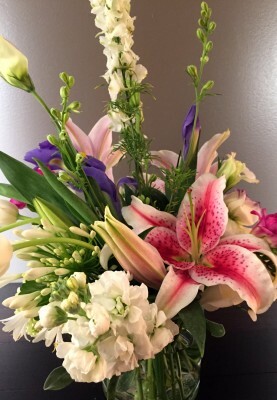 Knowing your relationship (parent, spouse, sibling, co-worker, friend, love interest) to the recipient provides some insight to how we'll design the arrangement and guide you through the other areas of ordering flowers. What type of arrangement and what budget do you have in mind? Most often your 'why' guides us towards a style or type of arrangement to match your occasion. The 'what' can be as simple as deciding if you want to send a vase arrangement, loose flowers, a hanging basket, an outdoor planter or a houseplant. Your budget will guide us in selecting flowers and determining the size of the arrangement you'll send. Part of the budget considerations will also be sales tax and delivery. With Design n Bloom, there aren't any other fees when you order flowers. If you order through an online florist, we might end up making the arrangement, but they get a portion of your budget, so the arrangement will be smaller. If you call us in the morning, we can deliver most arrangements on the same day. Of course, we do appreciate when you call ahead, and that gives us more opportunity to bring in any special flowers that would enhance your arrangement. There are a few other things that help get your delivery there on time - knowing when the person will be at the location is essential. We require someone be available to receive the flowers - we won't leave them unattended, even for 'a little while'. If no one is home when we attempt delivery, we leave a note with the time we were there and ask them to call us to reschedule a time convenient for them. If we have a phone number, we'll call them, too. Where would you like them delivered (home, office, hospital, church, funeral home)? Where is the best place to deliver the flowers? Sometimes, it depends on the occasion. Other times, where is closely tied to when. Flowers for weddings, funerals, and illnesses often are delivered to places people are for specific periods of time. Work and home offer the greatest possibilities for delivery times. In any case, an exact address is critical. Eagan is full of neighborhoods where there are multiple streets with the same name, just different designations (street, avenue, drive, road, boulevard, lane, trail, circle, court, way, glen, parkway). The direction (north, south, east, west) assigned to the street also makes a difference. If you are having the flowers delivered to a business, there might be a building designation or multiple locations or campuses for the business. Knowing that ahead of time ensures your delivery gets to the right place on time. Why are you sending flowers? Are you sending flowers for a birthday, anniversary, 'just because', get well, new baby, new job or a new home? The occasion also helps us in designing the floral arrangement for you. But, we just don't want to know the occasion, we'll also want to know what message you'd like to include on the card with the flowers. We can help write your message, or there are millions of results when you search for 'what to say when you send flowers', if you get stuck on what to say. How would you like to take care of payment? We take all types of payment - credit cards (Visa, MasterCard, Discover, American Express) , PayPal, cash, and check. We can also send you an online payment option, so you can handle the details without having to share your credit card or bank information with us. Payments are due and processed on the day of delivery. To keep things secure, we'll handle this when we call to confirm your order details - we do not store any credit card information, so we'll have to do this every time you order.